The Best Homemade Tomato Sauce | Eat. Love. Namaste. I have been making homemade tomato sauce for quite some time. It’s super easy, requires minimal effort and always turns out delicious. 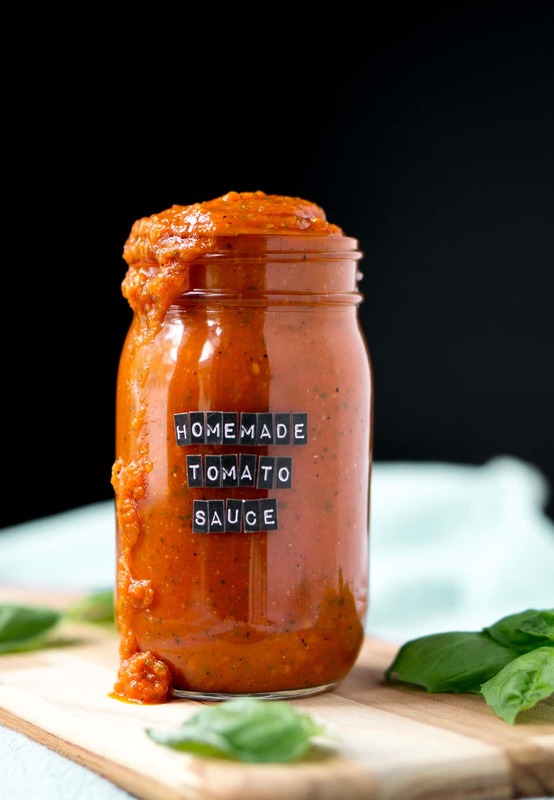 To make this tomatoes sauce for a family of 4, you will need about 4-6 fresh tomatoes (depending on the size of the tomato), 1 sweet onion, 4 garlic cloves, 1 poblano pepper, and a handful of fresh basil. Everything else you’ll need to make the sauce is in your pantry! 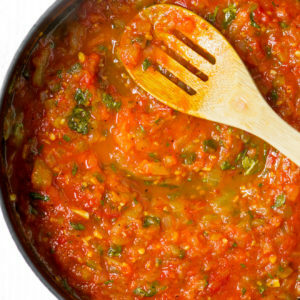 This tomato sauce is a little sweet and spicy, and is a mouthful of flavor! 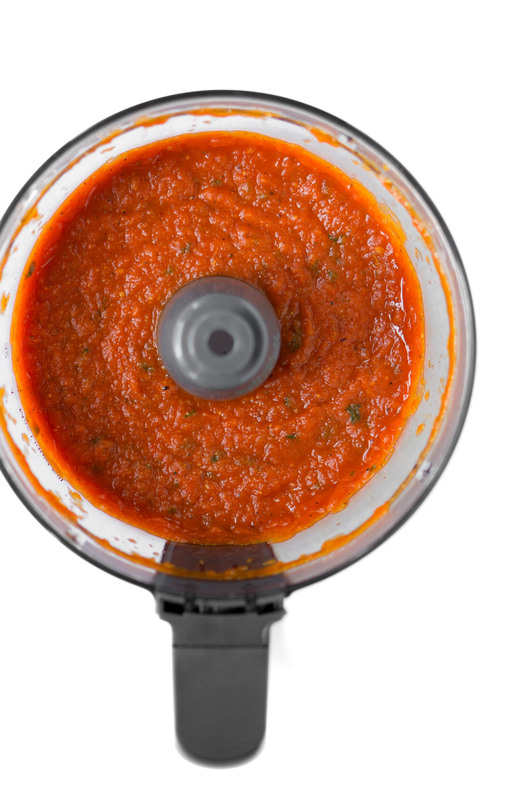 One of our favorites to use for spaghetti and pizza! That’s right friends, this is a 2 in 1 tomato sauce, and it’s the best! If you use heirloom tomatoes of different colors, we noticed a slight change in flavor, which is even tastier. Heirloom tomatoes are juicier, which you want for homemade tomato sauce. 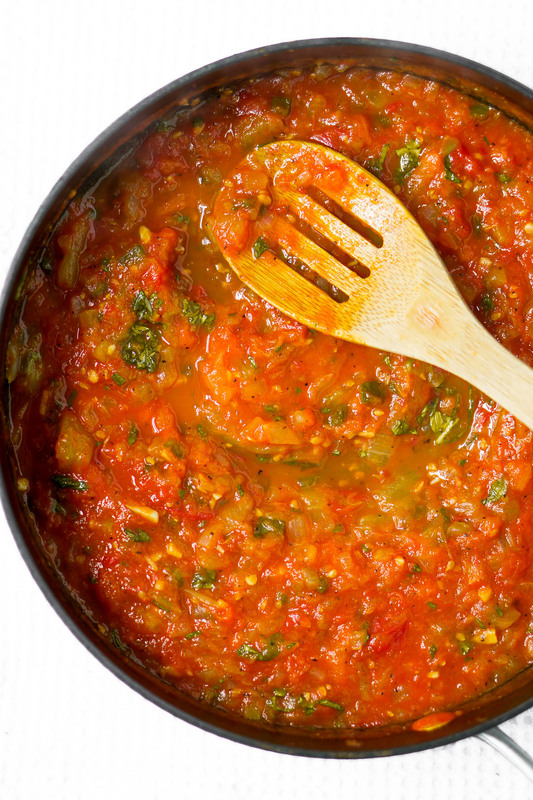 Whenever heirloom tomatoes are in season, buy bulk and make this sauce! You will not disappoint! When tomatoes are out of season, and no heirlooms are in stock, I usually default to the hothouse tomatoes (these are usually fresher as they aren’t traveling far to get your local grocery store). The sauce still tastes great and beats any canned tomato sauce in the grocery store! If you are busy throughout the day and craving a homemade tomato sauce, but can’t squeeze in the time to prep the tomatoes, sub a can of diced tomatoes (15-oz) and prepare the same way as noted below. I hope you all love this recipe for both homemade spaghetti and pizza! It’s truly the best sauce, ever! YUM! The best 7-ingredient, homemade tomato sauce! Perfect for spaghetti or pizza night! Bring a pot of water to a boil over high heat. Add 1-3 tomatoes, and cook for 35 to 60 seconds until the skins start to wrinkle and split. Remove the tomatoes from the water and put them into a prepared ice bath or in a bowl with cold water, running continuously over them in the sink. Remove the skins from the tomatoes and put the tomatoes on a cutting board to cool. Roughly chop the tomatoes and set aside. Add 3 Tablespoons of olive oil to a skillet over medium-high heat. Add the chopped onions and poblano pepper, season with salt and pepper, and sauté for 2-3 minutes. To the skillet, add the minced garlic and sauté for an additional 2 minutes. Add the chopped tomatoes, sugar, salt and pepper, and mix to combine. Reduce to medium-low and simmer for about 45 minutes to 1 hour and a half (this time will vary depending on how many tomatoes you use), or until reduced in size. Add in the chopped basil and red chili flakes (optional) and cook for an additional 5 minutes. 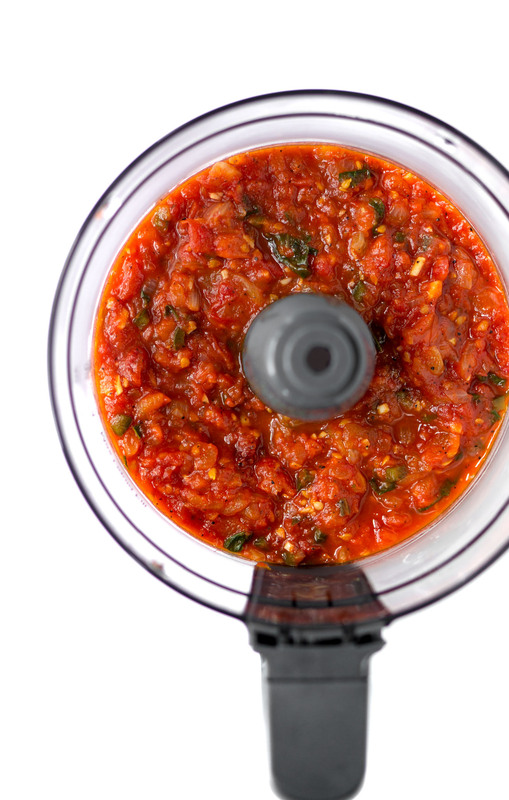 Use the sauce as is (chunky) or add to a blender to make a smooth sauce.